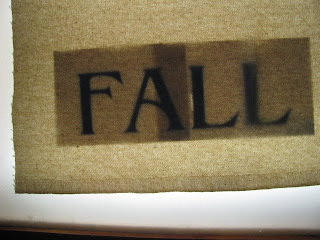 I felt the urge to add to my fall decorations. 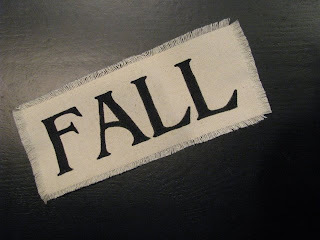 I wanted a little sign that spelled FALL. I decided to take an old idea of mine and tweak it a bit. Please forgive the idea rerun. But, if you're like I am, you probably need to see something a few times before you decide to jump in and craft it. So here's your second chance! they have scrap pieces of wood for really cheap. They'll even cut it down to size for free. ask the builders if you can have a scrap or two. Next, I printed out the word to fit my wood. I placed the printed word under the canvas/duck type fabric and copied over it using a paint marker. and frayed the edges. I painted my wood block. 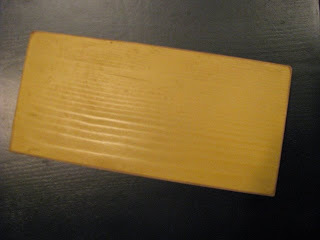 I used a spray paint color called Honey. (as I did the first time). using upholstery tacks. 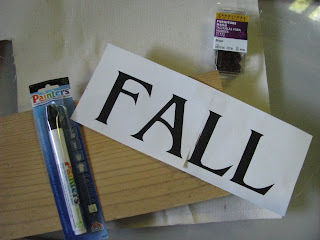 Then I embellished my sign with ribbon and a metal leaf. And there you have another sign that fall is here! Cute, Cute, Cute! I have got to get me a lightbox. I wonder if you could tea stain the canvas. To make it look older? Wow...so simple but so cute Well, not simple for me...I love your ideas! Stop giving me so many projects over the weekend!...hee hee! Love the way you use so many materials! I think I have everything for this one! So cute! Wow! I love that. It's so simple and fun. I may be trying that out soon. Thanks! That is very cute. I really like the frayed fabric. Yep I am going to add this along with the other 50+ things to do. I think I can handle this one. 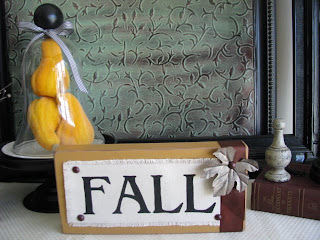 "FALL"ing in love with the idea!! Very easy too. i love this! it's so simple, cheap, and way cute! what type of stain did you use on the edges?? So adorable! I bought the triple opening frame from $ Tree today. I will share the finished product with you. They had no crows! boo-hoo! Great Idea! I am goingto have t steal that one. AWESOME! Love your creative ideas! What a great idea! I think I'll make a prim version of that! Love it! Thank you so much for another inspiring craft!! Have a garage FULL of scraps, can't wait to start one! Joy, you seriously need to be working for one of the crafting companies. You come up with some great ideas! I just finished making my 5 minute craft! I had so much fun! 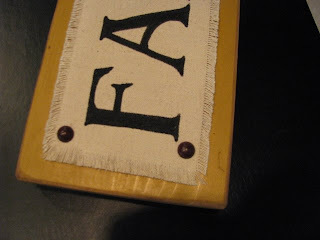 Check out my plaques on jrtammymacdonald.blogspot.com Thanks for the fun ideas JOY! Super cute! Love your ideas! I love that Joy...I agree with Rhoda..you could easily get a job with one of them! Every.single.idea! I just love it! Thanks for visiting my blog. This is so fun. Loved your new idea too. Amazing the things you come up with. What talent. Happy first day of fall on Monday! I've tagged you on my blog! I would love to know 7 quirky things about you! If you'd like to play, head on over!! LOVE THIS IDEA, TOO! Rhoda's idea was correct---or you could write "how to" book on crafts. You could sell enough to blogging friends to need a reprinting! Love your blog, Joy! What a great blog! Joy! Thanks for coming by my blog! I really love to see how many SIMILAR things we do, like the lamps and the blocks and the posts, yet our homes are sooooo entirely different! How creative!!!! I need to make one of those for my house!! What a great job! That looks soooo nice. Happy Fall! I *luv* your blog so much that I have a little something for you! Please come by my blog to pick it up. =0D Be sure to tell your hubby it's for him too, lol. So Cute!!!! I think I might try this one!! Oh my.. I see a copycat in my future.. that is the cutest!!! Thanks Joy for always being an inspiration!! !